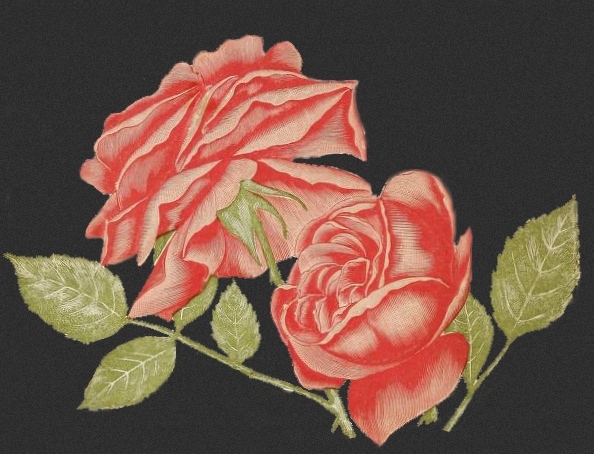 A bit of nice, vintage cover art from 1894; a pair of pink roses. They adorned the cover of the Manual of Everything for the Garden; published by Peter Henderson & Co. The original cover illustration had somewhat shown it’s 120+ years. There were stray marks, stamps from a library and foxing. While much of the rest of the cover art was somewhat damaged, with a little cleaning up and some cloning, I was able to get it to this state. And, instead of a plain white background, for a bit of drama I’ve added a dark one. I think it really makes the pair of pale pink roses and green leaves stand out. I think it would make a wonderful note card or addition to a larger mixed media piece. Enjoy.